Don’t ever believe the lie that the Bible is boring and irrelevant for today. No matter how often I read it I remain amazed at the relevancy of it even in 2015! This morning I was reading in Ezra. Ezra was a priest, a scribe and expert in the words of the Lord’s commandments (Ezra 7.11). It is fairly safe to presume Ezra wrote the Old Testament account bearing his name – he documents the return to Jerusalem covering 120 years, including the end of captivity in Babylon, in two segments. The first being chapters 1 – 6 of the book. These chapters tell the story of the rebuilding of the Temple, and chapters 7 – 10 recount Ezra’s actual return to the City. It is chapter six that got my attention this morning! The Temple was near completion and in Assyria, King Darius ordered a search for a document that outlined what exactly was to be done with the Temple treasures, which were taken into captivity the same time the people were taken out of Jerusalem and into Babylon. That particular scroll was found (read about it here) and every minute detail was carried out with diligence, under a death threat from Darius to anyone who would hinder it. Ah! Their Temple was now complete – even the articles of the house of God were restored. The returned exiles celebrated The Passover and the Feast of Unleavened Bread seven days with joy! It is verse 22 that causes me great excitement! The LORD made them joyful, and turned the heart of the king of Assyria toward them, to strengthen their hands in the work of the house of God, the God of Israel. Yes, times have changed – but God has not. Have you been told by someone in authority that you can’t have that job? You can’t go to that school? You don’t qualify for that mortgage or lease? I am here to remind us that God holds the heart and mind of the king (the authority) and He can turn it however He wants it to go. God can take no’s and turn them into yes’es – I’ve seen it happen. I’ve witnessed the change in a person’s decision – nothing can thwart God’s good, acceptable, and perfect will. Absolutely nothing. Don’t be shy with God. Be bold and brave. Go out on a limb. He will be there to catch you – the beauty of this? When we ask, in faith and trust, He is not going to give us something not-good for us. Remember, He sees the beginning from the end and all the in-between stuff. God is a game-changer. Don’t be shy with God. Be bold and brave. Go out on a limb. He holds and turns hearts. I thought perhaps we could all use a reminder! Brittany, I changed my link-up with WWI – I didn’t feel as though this was the right “fit”. Oh how I love this, it gives me Hope!! Love, Love, Love this! You KNOW I love walking in His Word! LOVE how you are so passionate on here! Go for it! Press past your insecurities and find real JOY in and through His promises! YES YES YES!!! I’m over going YOU GO GIRL!!!!! Bethany, I feel a kindredship growing here!!! Thank you for the encouragement today, Susan! I’m so grateful that God has things covered and I don’t need to stress (but I seem to need constant reminders of this fact!). Not sure we’d get anything done, Beth, except talking about the goodness of God!!! Yes! This is so perfect for me today and well, pretty much everyday! God has me helping a lady out with calligraphy, that I have never met before until today. When I first met with her, she mentioned that she has a son named, Ezra. Anyway, I felt like our meeting was a for sure a God appointed thing before reading your post and now, well, this just makes me smile big! Perfect! I love seeing readers smile big! What a powerful truth to cling to! 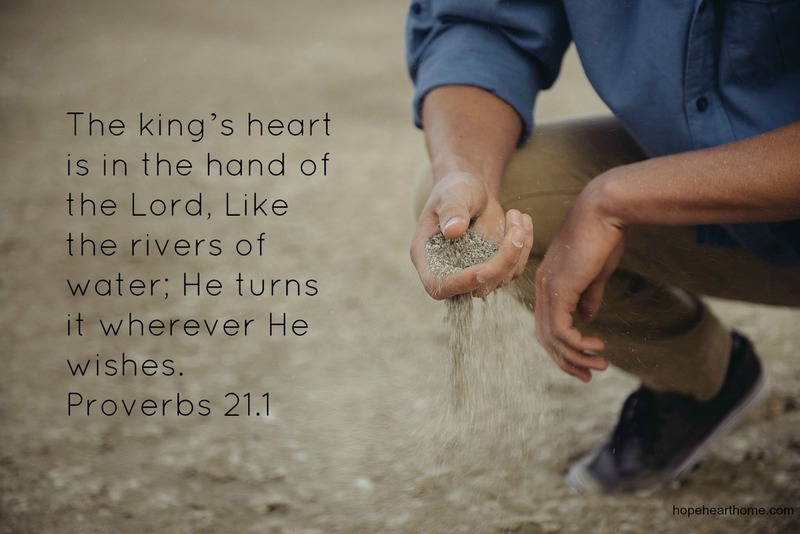 He holds the king heart in his hands! Nothing is to great for our God! Whooohoo I’m getting excited over here! What a relieft knowing He is in control! Feeling it with you, Laura! Wonderful post!! God CAN change a YES to a NO – even the other way around if that is what HE wants!! Thank you for reminding us, for sharing this post today! YES! God is for us – such a good reminder to approach him and know him in a brave way. Thanks for sharing at #ThreeWordWednesday. Thank you Susan! I am living proof to what God can do when dealing with people in authority. When I was going to college I was told by a woman in authority that I did not qualify for a scholarship. At first I just sat there and excepted what she said. I looked over at my husband as he stared back at me. I stood up and said thank you to the woman and started towards the door. SUDDENLY, I turned around looked at the woman who spoke those words and this is what I said, ” Jesus hasn’t brought me this far to be denied ! I have more faith than that .” That woman opened a drawer, pulled out a piece of paper, signed it, and said,” You now have this semester paid for!” AND just last month I went into my bosses office and requested that she put me in a different business position. She told me that wouldn’t happen. Two weeks ago she called me into her office and said that she wants to offer me the position that I asked for but I would have to be interviewed with a few other people! I love Jesus with all my heart! In saying all this I have to also say… I don’t always get what I want and I still love Jesus with all my heart! Test to testimony, Margie! Love it! Susan, every time I come, you encourage my heart. You have no idea how much I needed this lesson today. Hugs. Thanks Susie for reminding us of this! It’s so encouraging to know that God can change the hearts of people in our families and those whom we love but also to know that we can pray for God to change the hearts of those who are leaders in our country and thruout the world. Imagine if everyone of us prayed every day for God to turn the hearts in all the leaders (kings) throughout the world …what a peace filled world it would be! Ali, God would have to listen!!! I’m so thankful that God is in control and has His perfect plan for me. He can do it!! Thank you God! NOTHING is impossible with or for Him, Jan! Thanks Susan. This is so inspirational and a reminder to all of us that God can change it all, yes everything, the unexpected in an instant. Our Lord loves to make the impossible possible. You know, He really can, Donna! This is so encouraging, especially as we go into political season and people are frothing at the mouth about it. It doesn’t matter who holds what office, God is still in control! I’m bolding asking that God guide my daughter’s fiancé visa process through the red tape! We’d like him to have his visa in time to have a July 15 wedding :). I just worked on two China visas for my boss. Where is fiance from?